The IQ test has been synonymous with intelligence for over a century. In the late 1800s, Sir Francis Galton developed the first broad test of intelligence (Flanagan & Kaufman, 2004). Although he was not a psychologist, his contributions to the concepts of intelligence testing are still felt today (Gordon, 1995). 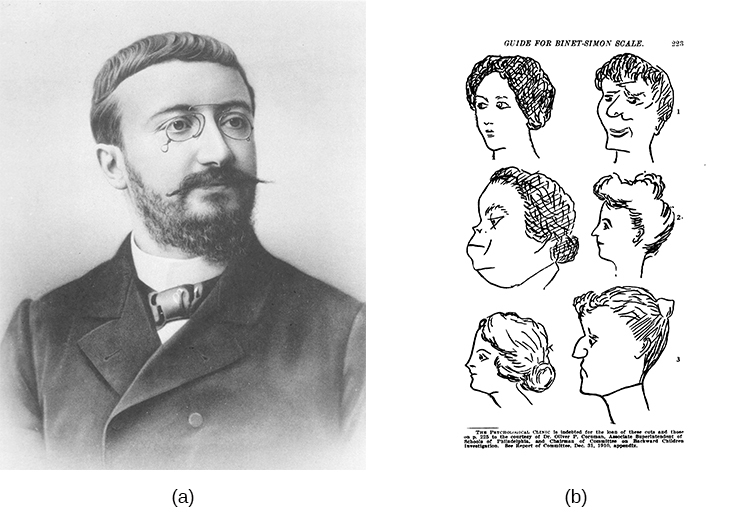 Reliable intelligence testing (you may recall from earlier chapters that reliability refers to a test’s ability to produce consistent results) began in earnest during the early 1900s with a researcher named Alfred Binet ([link]). Binet was asked by the French government to develop an intelligence test to use on children to determine which ones might have difficulty in school; it included many verbally based tasks. American researchers soon realized the value of such testing. Louis Terman, a Stanford professor, modified Binet’s work by standardizing the administration of the test and tested thousands of different-aged children to establish an average score for each age. As a result, the test was normed and standardized, which means that the test was administered consistently to a large enough representative sample of the population that the range of scores resulted in a bell curve (bell curves will be discussed later). Standardization means that the manner of administration, scoring, and interpretation of results is consistent. Norming involves giving a test to a large population so data can be collected comparing groups, such as age groups. The resulting data provide norms, or referential scores, by which to interpret future scores. Norms are not expectations of what a given group should know but a demonstration of what that group does know. Norming and standardizing the test ensures that new scores are reliable. This new version of the test was called the Stanford-Binet Intelligence Scale (Terman, 1916). Remarkably, an updated version of this test is still widely used today. In 1939, David Wechsler, a psychologist who spent part of his career working with World War I veterans, developed a new IQ test in the United States. Wechsler combined several subtests from other intelligence tests used between 1880 and World War I. These subtests tapped into a variety of verbal and nonverbal skills, because Wechsler believed that intelligence encompassed “the global capacity of a person to act purposefully, to think rationally, and to deal effectively with his environment” (Wechsler, 1958, p. 7). He named the test the Wechsler-Bellevue Intelligence Scale (Wechsler, 1981). This combination of subtests became one of the most extensively used intelligence tests in the history of psychology. Although its name was later changed to the Wechsler Adult Intelligence Scale (WAIS) and has been revised several times, the aims of the test remain virtually unchanged since its inception (Boake, 2002). Today, there are three intelligence tests credited to Wechsler, the Wechsler Adult Intelligence Scale-fourth edition (WAIS-IV), the Wechsler Intelligence Scale for Children (WISC-V), and the Wechsler Preschool and Primary Scale of Intelligence—IV (WPPSI-IV) (Wechsler, 2012). These tests are used widely in schools and communities throughout the United States, and they are periodically normed and standardized as a means of recalibration. Interestingly, the periodic recalibrations have led to an interesting observation known as the Flynn effect. Named after James Flynn, who was among the first to describe this trend, the Flynn effect refers to the observation that each generation has a significantly higher IQ than the last. Flynn himself argues, however, that increased IQ scores do not necessarily mean that younger generations are more intelligent per se (Flynn, Shaughnessy, & Fulgham, 2012). As a part of the recalibration process, the WISC-V was given to thousands of children across the country, and children taking the test today are compared with their same-age peers ([link]). The results of intelligence tests follow the bell curve, a graph in the general shape of a bell. When the bell curve is used in psychological testing, the graph demonstrates a normal distribution of a trait, in this case, intelligence, in the human population. Many human traits naturally follow the bell curve. For example, if you lined up all your female schoolmates according to height, it is likely that a large cluster of them would be the average height for an American woman: 5’4”–5’6”. 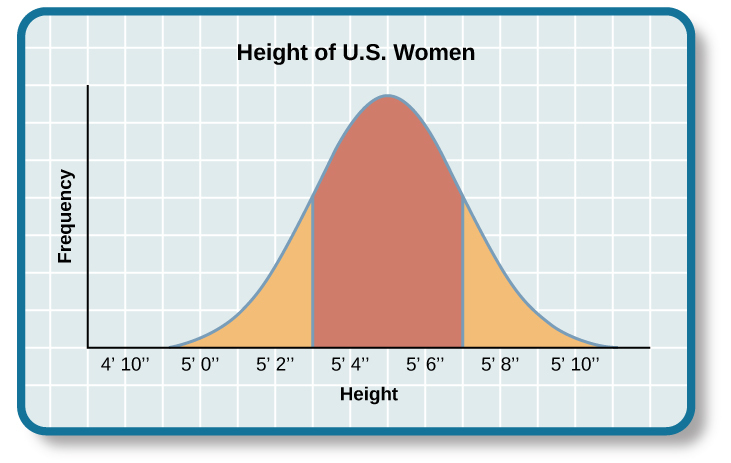 This cluster would fall in the center of the bell curve, representing the average height for American women ([link]). There would be fewer women who stand closer to 4’11”. The same would be true for women of above-average height: those who stand closer to 5’11”. The trick to finding a bell curve in nature is to use a large sample size. Without a large sample size, it is less likely that the bell curve will represent the wider population. A representative sample is a subset of the population that accurately represents the general population. If, for example, you measured the height of the women in your classroom only, you might not actually have a representative sample. Perhaps the women’s basketball team wanted to take this course together, and they are all in your class. Because basketball players tend to be taller than average, the women in your class may not be a good representative sample of the population of American women. But if your sample included all the women at your school, it is likely that their heights would form a natural bell curve. The same principles apply to intelligence tests scores. Individuals earn a score called an intelligence quotient (IQ). Over the years, different types of IQ tests have evolved, but the way scores are interpreted remains the same. The average IQ score on an IQ test is 100. Standard deviations describe how data are dispersed in a population and give context to large data sets. The bell curve uses the standard deviation to show how all scores are dispersed from the average score ([link]). In modern IQ testing, one standard deviation is 15 points. So a score of 85 would be described as “one standard deviation below the mean.” How would you describe a score of 115 and a score of 70? 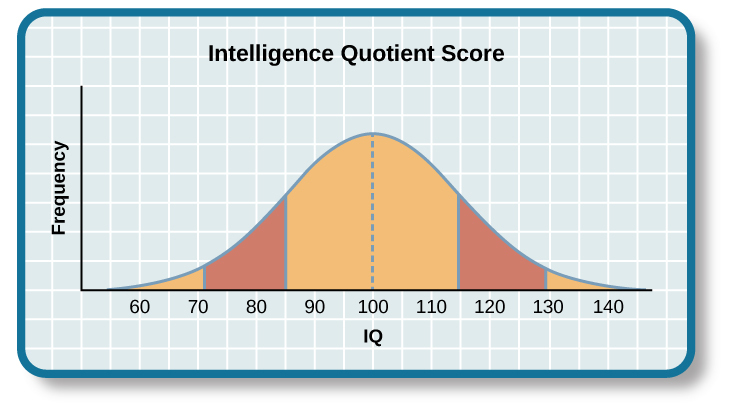 Any IQ score that falls within one standard deviation above and below the mean (between 85 and 115) is considered average, and 68% of the population has IQ scores in this range. An IQ score of 130 or above is considered a superior level. Only 2.2% of the population has an IQ score below 70 (American Psychological Association [APA], 2013). A score of 70 or below indicates significant cognitive delays, major deficits in adaptive functioning, and difficulty meeting “community standards of personal independence and social responsibility” when compared to same-aged peers (APA, 2013, p. 37). An individual in this IQ range would be considered to have an intellectual disability and exhibit deficits in intellectual functioning and adaptive behavior (American Association on Intellectual and Developmental Disabilities, 2013). Formerly known as mental retardation, the accepted term now is intellectual disability, and it has four subtypes: mild, moderate, severe, and profound ([link]). The Diagnostic and Statistical Manual of Psychological Disorders lists criteria for each subgroup (APA, 2013). In this section, we learned about the history of intelligence testing and some of the challenges regarding intelligence testing. Intelligence tests began in earnest with Binet; Wechsler later developed intelligence tests that are still in use today: the WAIS-IV and WISC-V. The Bell curve shows the range of scores that encompass average intelligence as well as standard deviations. In order for a test to be normed and standardized it must be tested on ________. The mean score for a person with an average IQ is ________. Who developed the IQ test most widely used today? The DSM-5 now uses ________ as a diagnostic label for what was once referred to as mental retardation. Why do you think different theorists have defined intelligence in different ways? Since cognitive processes are complex, ascertaining them in a measurable way is challenging. Researchers have taken different approaches to define intelligence in an attempt to comprehensively describe and measure it. Compare and contrast the benefits of the Stanford-Binet IQ test and Wechsler’s IQ tests. The Wechsler-Bellevue IQ test combined a series of subtests that tested verbal and nonverbal skills into a single IQ test in order to get a reliable, descriptive score of intelligence. While the Stanford-Binet test was normed and standardized, it focused more on verbal skills than variations in other cognitive processes. In thinking about the case of Candace described earlier, do you think that Candace benefitted or suffered as a result of consistently being passed on to the next grade? Measures of Intelligence by OpenStaxCollege is licensed under a Creative Commons Attribution 4.0 International License, except where otherwise noted.